It sounds philosophical, but it’s really functional. How does the automotive aftermarket know it properly calibrated an advanced driver assistance system? Scanning can tell you that a sensor or camera is operating correctly. However, it might not be able to tell you whether the technology is actually viewing the world correctly. For example, a camera looking the wrong way isn’t necessarily going to throw a diagnostic trouble code, nor is one taught by a misplaced target that a distance of 6 feet is 5 feet. It’s like a fixing a clock’s innards but returning it to the customer 20 minutes fast: The clock is fine from a mechanical standpoint. But its perception of the world is still wrong. Collision repairers at least have the security that following OEM repair procedures and using OEM parts on an unaltered vehicle should restore ADAS to pre-loss condition. But how do they know your calibration tech didn’t have an off day and position the target wrong or touch a seat during an occupant sensor initialization? A test drive can only take you so far — you can’t, after all, try to get into a crash and verify that the system would stop you in time. And if that one keeps you up at night, consider how your colleagues in the vehicle modification community feel. How do they know a liftkit didn’t alter ADAS functionality by changing the angles from which the vehicle sensors see the world? This issue has been recognized by SEMA, which in 2017 wrote it was working with the Society of Collision Repair Specialists on the subject. It’ll also be the topic of a forum at this month’s SEMA Show: “Customizing with Confidence,” scheduled for 1-2:30 p.m. Wednesday, Oct. 1. Both SEMA vehicle technology Vice President John Waraniak, the moderator, and SCRS Executive Director Aaron Schulenburg will be present, as will some other collision repair industry familiar faces: Hunter Engineering’s Kaleb Silver and asTech’s Jake Rodenroth. 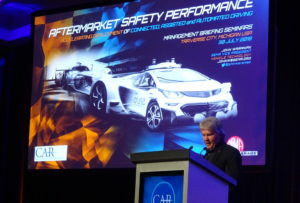 Waraniak also gave us an update on the issue this summer following his appearance on a Center for Automotive Research Management Briefing Seminars panel to discuss the aftermarket opportunity for ADAS. Warniak gave the examples of a 6-inch lift kit, 35-inch tires, “massive brakes,” and steering changes “that passed 126.” However, the ESC test as described by the federal government sounds complex and might not be feasible for a typical body shop. The same question that arose with electronic stability control exists for the next generation of ADAS technology. “A lot of our members are figuring that out,” Waraniak said. He said SEMA would put together a program to demonstrate such systems worked. He said a lot of builders currently work on the “buddy system,” taking a vehicle to collision repairers for a vehicle scan. Asked about the distinction between verifying a system merely works with a scan versus a means of ensuring it’s truly working as intended, Waraniak mentioned that OEMs might require road tests. He said SEMA members will conduct just as collision repairers and some insurers do. “It’s just in its infancy,” Waraniak said of the issue, pointing out that SEMA started working on FMVSS 126 a decade ago. 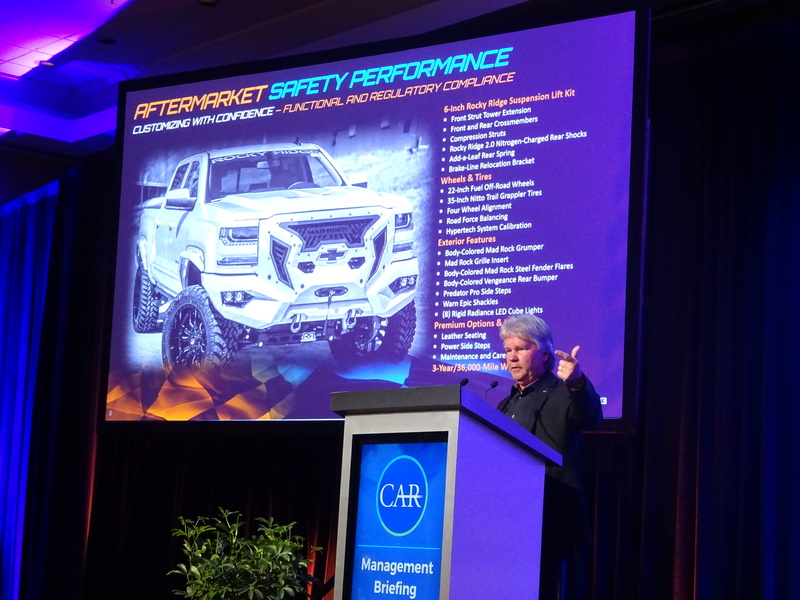 Waraniak said SEMA commissioned its 2017 Ducker Worldwide study of the ADAS market to “get proactive” on the topic. He said OEMs interviewed were about “half and half” on accommodating modifications. As for how OEMs would allow it, “they don’t know yet,” he said.